What does this really mean? The above quote portrays the importance that every healthcare organization must develop facility specific protocols that define the rules of engagement for the operations to detect, deter and mitigate fraudulent activity. In addition, these Policies and Procedures are dynamic, refined and current with the changing landscape related to regulatory, reimbursement and technological changes. For example, the innovation of cell phones with readily accessible camera functionality spurred a wave of HIPAA violations across the nation. Skilled Nursing Facilities immediately responded with additional policies on the parameters for employee, resident and visitor cell phone usage. This situation exemplifies the importance of the dynamic, refined and current policies and procedures. Another example is the Policy and Procedures for Transmitting MDS Assessments timely to the Quality Improvement and Evaluation System (QIES) Assessment Submission and Processing (ASAP) system. If the Medicare Administrative Contractor (MAC) queries a PPS MDS for a claims review and identifies that the MDS was NOT successfully transmitted and accepted in the QIES system, this will result in a technical denial with provider liability (i.e., no reimbursement or right to appeal). In closing, here is a question for you to ponder. 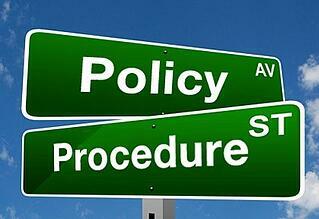 What is the first Policy and Procedure that must be implemented before any other? Harmony Healthcare International (HHI) is available to provide assistance. You can contact us by clicking here. Looking to train your staff? Join us in person at one of our upcoming Competency/Certification Courses. Click here to see the dates and locations.